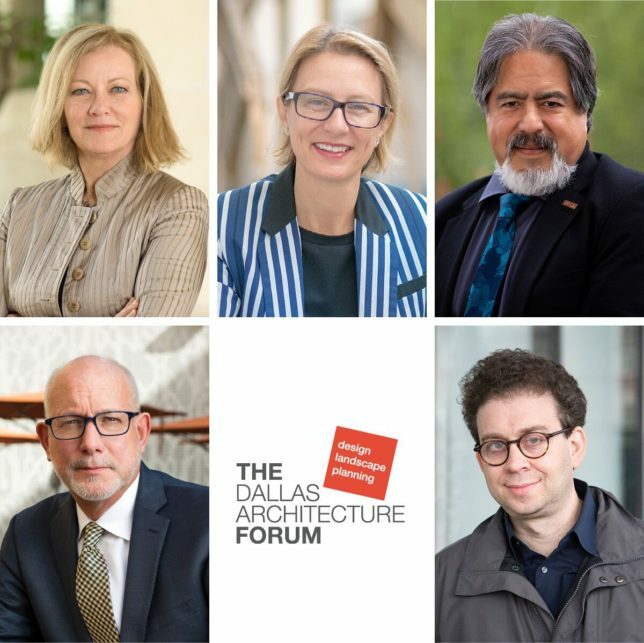 The Dallas Architecture Forum, a non-profit organization dedicated to providing public education about architecture, design and the urban environment, continues its Spring 2019 Lecture Series on Tuesday, April 2, 2019 with “Architecture Deans Roundtable” moderated by Mark Lamster, UT Arlington CAPPA Professor and Dallas Morning News Architecture Critic. Planning as they discuss the future of urban life in Texas. These highly respected thought leaders will examine both the vast potential as well as looming challenges our state faces as it becomes more of a major leader and economic force, both nationally and internationally. Program participants will be Dean Michelle Addington from the UT-Texas, Dean Adrian Parr from UT-Arlington, Dean Jorge Vanegas from Texas A & M, and Dean Jim Williamson of Texas Tech. Their illuminating conversation, moderated by Mark Lamster, Dallas Morning News Architecture Critic and UTA CAPPA Professor, will be an important evening not to be missed. “With the continued rapid growth of population, corporations, and businesses coming to Texas, there will be challenges in transportation, water supply, and the use of all our natural resources, as well as the need to explore the best design and building practices that will create the infrastructure of our state going forward. This Roundtable will provide a fascinating opportunity to hear from the leaders who are training the future creators and problem solvers who will address these issues across our state and beyond, and in their own areas,” stated Forum Executive Director Nate Eudaly. The Roundtable discussion will take place on Tuesday, April 2 at 7:00 p.m., with check-in and a complimentary reception beginning at 6:15 p.m., at the Horchow Auditorium at the Dallas Museum of Art. Season Sponsors for The Dallas Architecture Forum’s 2018-2019 Season are Faisal Halum — Briggs Freeman Sotheby’s International Realty, Maharger Development – Reggie Graham, and SMINK, Inc. Series Sponsors are HKS, Scott + Reid, O’Brien Architects and DLR Group | Staffelbach. Lecture Sponsors are BOKA Powell and Perkins + Will. Reception Sponsors are Diana + Frank Aldridge and CORGAN. Michelle Addington is the Dean of the School of Architecture at The University of Texas at Austin, where she also holds the Henry M. Rockwell Chair in Architecture. Formerly, she held the Chair in Sustainable Architectural Design at the Yale University School of Architecture and was jointly appointed as a Professor at the Yale University School of Forestry and Environmental Studies. Prior to teaching at Yale, she taught at the Harvard University Graduate School of Design, the Technical University of Munich, Temple University and Philadelphia University. Educated as a mechanical/nuclear engineer, Addington worked as an engineer at NASA/Goddard Space Flight Center and for E.I DuPont de Nemours before she studied architecture. Her books, chapters, essays, journal papers, and articles address topics ranging from fluid mechanics to the History of Technology to smart materials, and she has consulted on projects as diverse as the Sistine Chapel and Amazon rain forest. Dr. Adrian Parr is Dean of the College of Architecture, Planning and Public Affairs at The University of Texas at Arlington. She holds the UNESCO Chair on Water and Human Settlements and is a trans-disciplinary scholar working at the intersection of architecture criticism, aesthetics, political theory, and environmental studies. She has published eight books, the most recent being a trilogy on environmental politics and sustainability culture. She produced and co-directed the award-winning documentary “The Intimate Realities of Water.” which chronicles the complex relationships between water, gender, sanitation and development in Nairobi’s shantytowns. Dr. Jorge A. Vanegasis Dean of Architecture at Texas A&M University since July 2008, and a Research Professor at the Texas Engineering Experiment Station. His scholarly and professional activities include creativity, innovation, design, and entrepreneurship; built environment sustainability; and integrated AEC capital asset delivery and management. He holds a Bachelor’s degree in Architecture from Universidad de los Andes in Bogotá, Colombia, and Master of Science and Doctorate degrees in Construction Engineering and Management from the Department of Civil and Environmental Engineering at Stanford University. James Williamson received his Master of Architecture at Cranbrook Academy of Art (under Daniel Libeskind) and studied in the Graduate Program in the History and Theory of Architecture at the Architectural Association. Williamson has taught at Cornell as Director of the Masters and Bachelors in Architecture Programs, Harvard, the Georgia Institute of Technology, The Rhode Island School of Design, Rice University, The Cooper Union, Columbia University and the University of Texas at Austin. Williamson is now the Dean of the College of Architecture at Texas Tech University where he is revamping the curriculum, coordinating a new university-wide effort for Marfa, Texas and leading the effort for a new building for the College of Architecture. Mark Lamster is the award-winning architectural critic of the Dallas Morning News, a professor in the architecture school at the University of Texas at Arlington, and a Loeb Fellow at the Harvard Graduate School of Design. His acclaimed biography of the late architect Philip Johnson, The Man in the Glass House, was published in November 2018 by Little, Brown. The Dallas Architecture Forum is a not-for-profit civic organization that brings leading architectural thought leaders from around the world to speak in Dallas and also fosters important local dialogue about the major issues impacting our urban environment. The Forum was founded in 1996 by some of Dallas’ leading architects, business, cultural and civic leaders, and it continues to benefit from active support and guidance from these citizens. The Forum fulfills its mission of providing a continuing and challenging public discourse on architecture and urban design in – and for – the Dallas area. The Dallas Architecture Forum’s members include architects, design professionals, students and educators, and a broad range of civic-minded individuals and companies intent to improve the urban environment in North Texas. The Forum has been recognized nationally with an AIA Collaboration Achievement Award for its strategic partnerships with other organizations focused on architecture, urban planning and the arts. For more information on the Forum, visit www.DallasArchitectureForum.org. For Twitter, our account is DallasArchForum. For more information, please contact: Sharon Cooper, 214.794.1610 or scooper21@yahoo.com.